Coming in January 2020 (details) Pre-Order now for estimated shipment in January 2020 (estimated date / subject to change). Rocking into our world from the pages of Dark Nights: Metal comes the fastest and deadliest man in the Dark Multiverse - the Red Death! A menacing mash-up of Batman and the Flash, this Dark Knight came about when a once-noble Caped Crusader stole the Speed Force from the Flash, hoping to prevent tragedies in the past. This transfusion of heroes produces a sinister speedster with bats instead of lightning emanating from its body during velocity bursts. 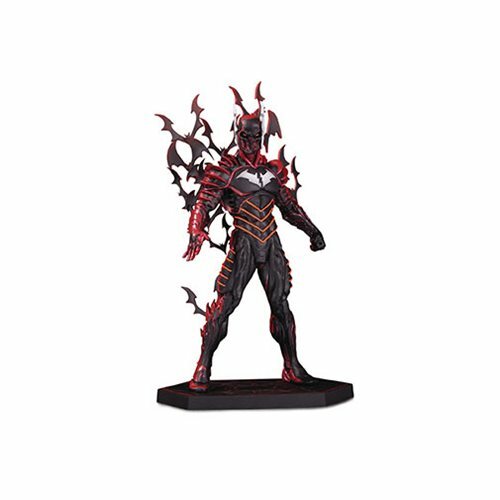 The high-speed horror is cast in polyresin, allowing for rich details-like the cascade of Speed Force-summoned bats-to emerge in the final product. The Dark Knights: Metal Batman The Red Death Statue stands about 8 1/4-inches tall, is a limited edition of 5,000 pieces, and comes individually numbered.